Q: Is the Dutch VHS Version uncensored? This movie should be a cult classic but isn't . . .yet. Apparently the 10 or 12 people (worldwide!) who have seen this movie have not yet spoken up enough about it to elevate it to cult classic status. When I first heard about it I mistakenly assumed from the title that it had something to do with zombies or vampires or something like that. Well it doesn't! There are monsters to be sure but the kind we all run the risk of encountering; the narrow minded bigot who hates anyone who differs from his own view of what "normal" should be. This movie deserves to be recognised for many reasons. For one thing the 2 biker gangs in it (The Scorpions and The Road Agents) are real gangs; for another the music was written by Mike Nesmith. Yes, THAT Mike Nesmith, the former Monkey; and for yet another it is one of the most brutally honest independent movies to come out of the 1970's putting those glossy, sugar coated versions of biker life put out by American International to a well deserved shame. (Sorry, Roger.) We are on the side of the bikers from the opening scene when they surround an elderly couple in a car with a flat tire. We are expecting the worst but the bikers change the tire and ride on without even waiting to be thanked! This was filmed in 1976 so the Vietnam War was over and the Hippie Era had crashed dismally but America was still licking its wounded ego over the war they "lost" and returning soldiers came home to a society that made them pariahs. Many fought back against the only enemies they had left, the societal dropouts who had dodged the draft and had been living free and indulging every impulse from mind expanding drugs to free love while they, the alleged "good Americans", had been away fighting a hopeless case. Okay that was the editorial, now back to the review. 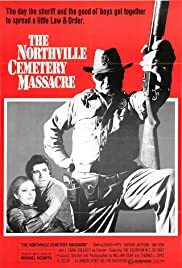 A redneck sheriff's deputy rapes a local girl who has rejected his romantic advances and puts the blame on a member of a biker gang that is passing through town. This sets off a smalltown war and underscores the intolerance and potential for violence that lurks beneath the shallow veneer of the Norman Rockwellian style smalltown life. The bikers fight back by arming themselves and soon it's rednecks vs. bikers and bullets are flying by the hundreds. The use of explosive squibs is used primarily for shock value but this is the earliest movie I can recall (apart from THE WILD BUNCH, that is) that used them quite so much. Prior to this screen violence had been mostly bloodless until Sam Peckinpah broke new ground with THE WILD BUNCH which left audiences and exhibitors alike gasping. There is a PATTON-inspired speech in front of a giant American flag; there are shootings, knifings, beatings, one exploding helicopter that is the worst special effect in the movie (an obvious miniature) and a powerful ending that . . .oops, almost gave it away. This is a hard movie to find but it is well worth the search. Check it out and then don't be shy about e-mailing me and telling me how you feel about that ending! Trust me, you WILL be talking about it.